Olivia McMahon in Art & Photography on 24 November, 2016. When we think of the hallowed halls of Italian art, the Renaissance masters, Caravaggio’s Baroque and even classical Roman sculpture spring to mind; ready to educate and ameliorate while we gawp amongst an international sea of tourists in institutions like the Uffizi and the Vatican Museums. In fact it’s quite hard to overstate the importance of a handful of Italian artists in terms of their contributions to the world of art: Da Vinci’s Vitruvian Man and the divine realm of Mannerism are by no means insignificant blobs on the expansive canvas that is the history of art. Yet such seminal works of art, despite having undoubted Italian connotations they have become somewhat globalized, almost too famous for the good of their own people. In the long twentieth century, after the ill-fated and worn out ideals of neo-classicism and Futurism had been force-fed to the people under a Fascist state, art for the ordinary Italian man and woman was crying out for production. Who would paint the new Italy? Enter the Corrente – a group of dissenting artists whose core commitment was to lambast the moral bankruptcy of fascism and the art of the state through their own creations. Crocifissione, (1941) Galleria Nazionale D’Arte Moderna, Roma. Sourced via Flickr. Perhaps the most famous of these was Renato Guttuso, a Sicilian artist whose humble origins, as well as his formative experiences as a young man in Milan, helped to form what would become known as Expressionist Realism in a lifelong career of artistic social commentary. Though his style would fluctuate under various influences, it cannot be denied that his paintings always exhibit either a heady mixture of political rhetoric and vibrant colour (usually red to emphasise his commitment to Communism), or his inspiration by the his homeland: the food, the landscape, the people. Derided by the ancient and powerful pillar of the Catholic church in Italy for his allegedly sacrilegious depiction of Christ in his seminal Crocifissione/Crucifixion (1941), his membership of the outlawed Italian Communist Party made him something of an anti-establishment figure. Indeed, his friend and fellow painter was to nickname him ‘Sfrenato Guttuso’ – ‘Unbridled’ Guttuso. The anxiety of the unbridled horses and the elements of background cubism in Crocifissione betray the influence of his friendship with Pablo Picasso, with this controversial painting bearing similarities to the latter artist’s seminal work Guernica (1937). The subject matters may be dissonant, but the impassioned resistance to the oppression of the downtrodden remains common to these artists. 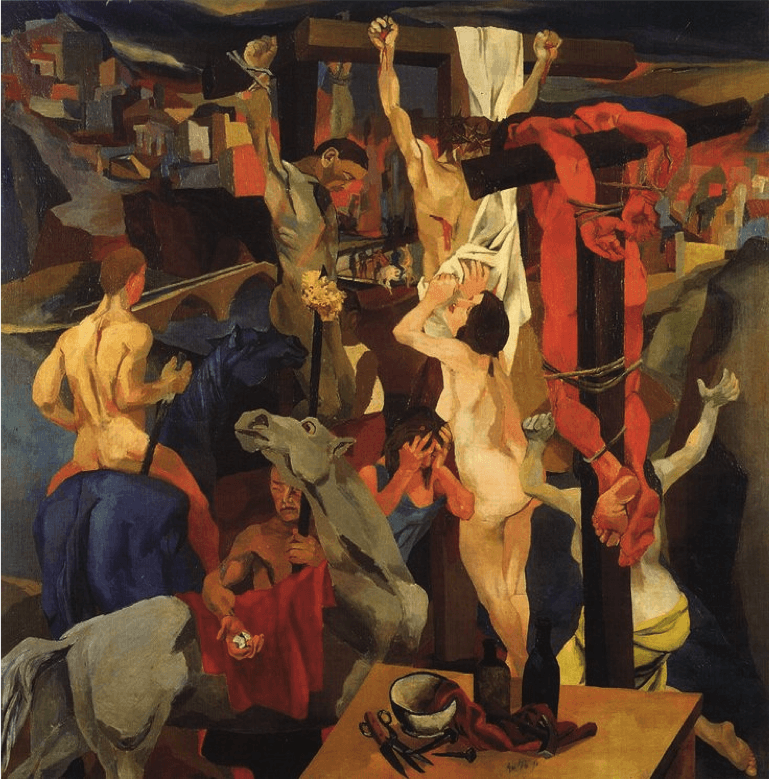 Guttuso dedicated the painting to the oppressed: “I wish to paint the torment of Christ as a contemporary scene… as a symbol of all those who, because of their ideas, endure outrage, imprisonment and torment”. Guttuso seems simultaneously to be the mouthpiece for the broken Italian coping with recent national unification and the turbulence of Fascist terror, and the hand – painting their struggles without the fantasy of classicism or the frenzy of Futurism. 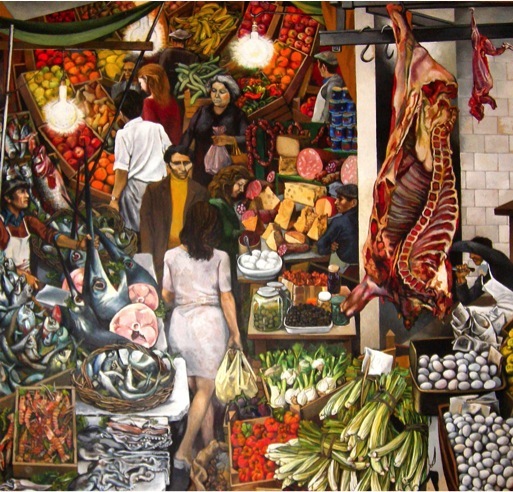 But what I see as the gem in Guttuso’s realist crown is the enormous La Vucciria – the open air market of Palermo immortalised on canvas. The word ‘Vucciria’ in Italian translates approximately to ‘bedlam’, and this is immediately evident upon first sight of the painting. It is an assault on the senses: the vast crates of produce are made almost tangible to the viewer, to the extent that you can essentially smell the mingling of fennel with wild red Sicilian prawns. The tastes, smells and colours of the terra are transmuted into oil on canvas with no dearth of passion. And if we look closer, we can see that there is a deeper storyline: Guttuso explained that the vertical line occupied by the market shoppers represent the line of life, of vitality. The horizontal line is more difficult to identify – notice the threatening stance of the fishmonger, whose grip on his swordfish’s point is matched by a glare across the market’s passage to the butcher, whose knife has been mysteriously painted over, leaving only his reciprocal glare intact. This line represents death. The lines form a cross – evoking not only the church, but the ancient and ongoing rivalry between Sicily’s fishermen and agriculturists. Thirty years after the production of Crocifissione, Guttuso proves, through his art, that he understands the fabric of what it is to be Italian. Here is an artist who could both represent the ongoing Italian struggle to assimilate a national identity under the strains of political and religious oppression, as well as the passion of the people, and the treasures of the land. If you can find a way to see and enjoy these visceral paintings, then do – there will almost certainly be no bustling mob of flash photographers. Just remember, they were made for and belong to the Italian people – and that is how it should remain.